No product can be shipped before passing inspection - This is our principle. OEM for many internationally renowned brands for more than 30 years, we always hold the spirit of richly cultivating Taiwan. Meanwhile, we are constantly looking forward to launch our waterproof and moisture permeable membrane product and establish our own brand. Eventually, V-TEX makes its debut. Many people had bought waterproof Shoes; however, is it really waterproof? V-TEX can pass waterproof test as many as 50000 times. Compared with other existing same products, V-TEX is unmistakably the best performance waterproof shoes. Ultimately waterproof, V-TEX did it! Today, we choose waterproof moisture wicking knit shoes as our starting point, and did all the things that others can’t do! 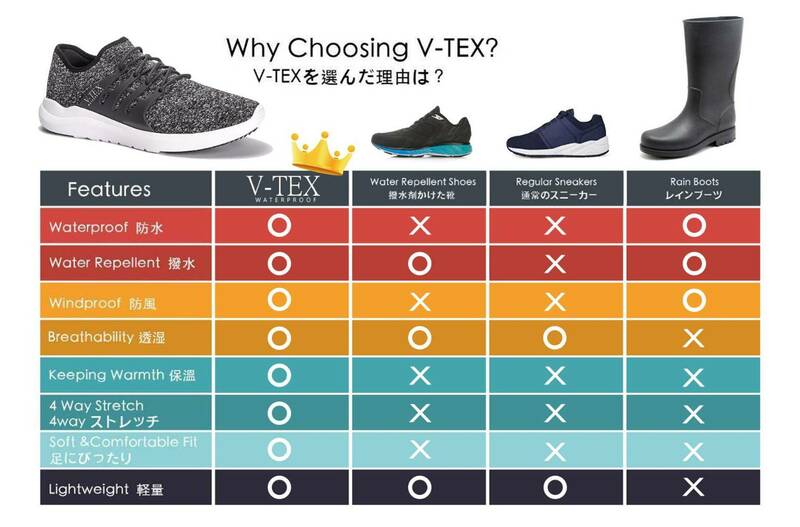 After heaps of times material combination and test, we created V-TEX knit shoes light and durable. Combine above advantages with function of waterproof moisture permeable membrane, V-TEX will give your feet great wearing comfort. The Best Waterproof On Earth, V-TEX.